2007 Domaine de la Romanée-Conti Montrachet ? 1991 Domaine Rousseau Chambertin ? Organized at the last minute, this intimate dinner with a small group of friends is a fabulous way to spend a summer evening in Manhattan. I always find it relaxing to step into Marea’s elegant dining room, perhaps because my memories of this space go back to the days when it was home to Tony May’s iconic San Domenico. Since 2009, Chef/Owner Michael White has delighted guests with a contemporary fish and seafood-based menu that is just as exciting today as it was when Marea first opened. The pastas in particular showcase White’s cooking and creative flair to a great effect. We gather at the bar around a gorgeous bottle of Drouhin’s 1990 Bonnes-Mares. Soft, perfumed and beautifully lifted, the 1990 is a real treat to drink and taste. The natural richness and depth that are such signatures of Bonnes-Mares nicely complemented by layers of nuance that have developed in bottle. This is such a beautiful and pleasing wine. Dinner starts with a selection of oysters and crudo. Perfect for a warm, muggy summer evening. 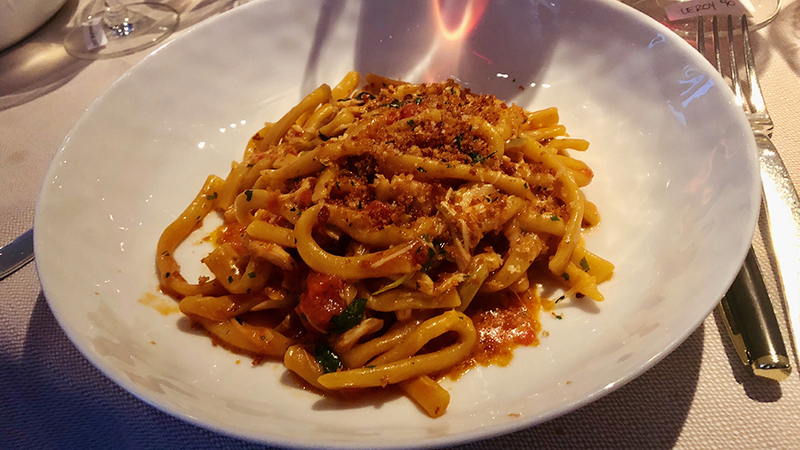 As always, pasta rules the day at Marea. 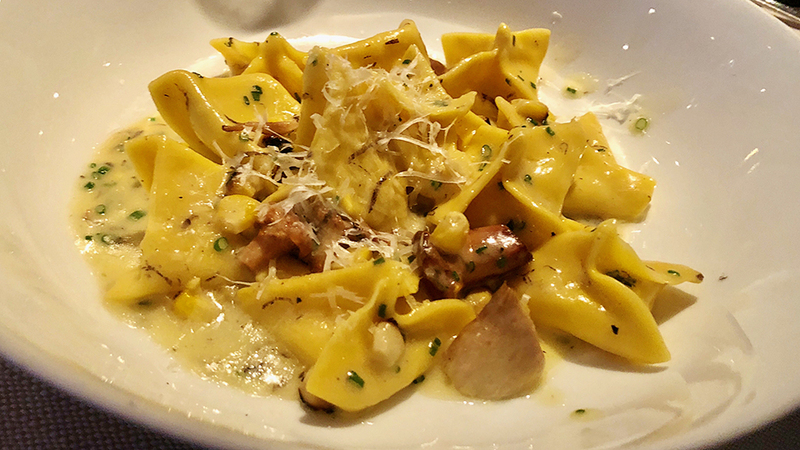 The quadrotti with black truffle, corn and chanterelle are absolutely divine, as are the strozzapreti with jumbo lump crab, stewed tomato and basil. Sometimes I think I should just order crudo and pasta at Marea and be done with it. But we have a lot of wines. 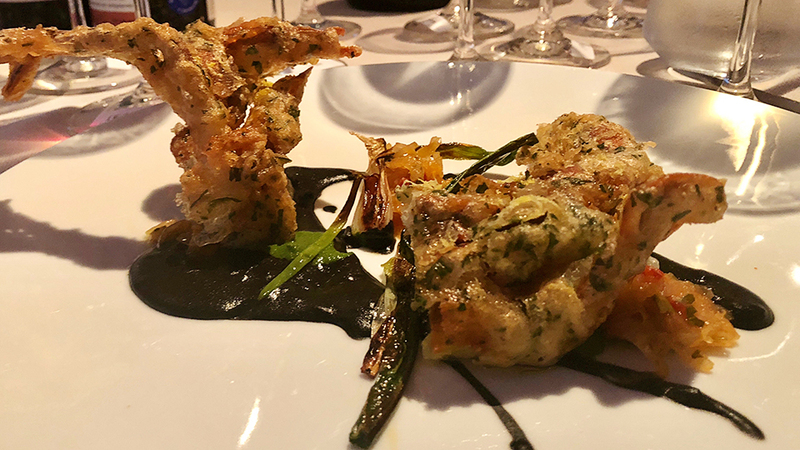 The crispy soft shell crab with squid ink, wild arugula, piperade and lemon is very good and also rich enough to work well with red wines. The grilled 50-day dry aged sirloin, which I split with a friend, is disappointing. I find the steak tough and not at all pleasant. To be fair, though, she likes it quite a bit more than I do. Lastly, I can’t say enough about the service of both food and wine. The team at Marea does an exceptional job in taking care of us, and that is not at all easy with this number of bottles and a dizzying number of glasses. On to the wines. 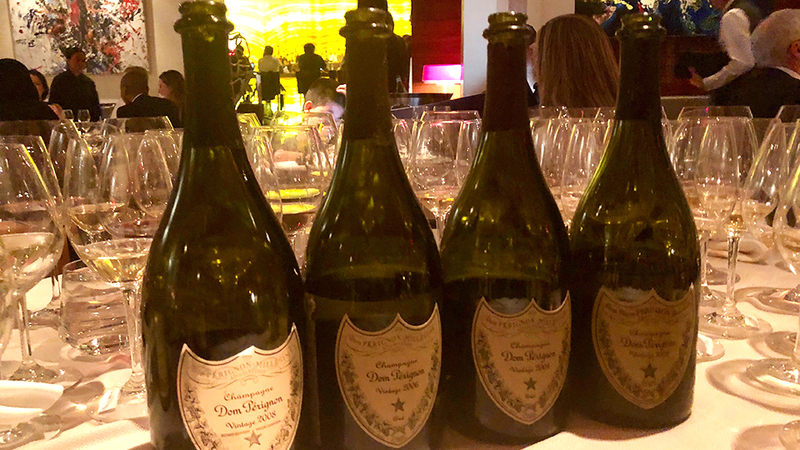 A small vertical of Dom Pérignon provides a great opportunity to taste the just-released within the context of several other recent benchmark vintages. Sadly, our bottle of the 1996 is not in perfect shape. The 2002, which I bought on release, more than makes up for that. Remarkably fresh and nuanced, the 2002 is positively stellar on this night. There are times when the 2002 is quite exotic, with the elevated ripeness of the Chardonnay more in evidence, but recently the 2002 has shown more a decidedly restrained side of its personality. Even in those moments, though, the wine’s natural richness and overall pedigree is never in doubt. This tasting confirms that the 2002 is an epic Dom Pérignon. I have always adored the Dom Pérignon. This vertical only reinforces that impression. The 2004 Dom Pérignon is not a huge wine, like the 2002, nor does it have the focus of the 2008, but there is something about its delicacy and overall sense of proportion that I find positively alluring. Still quite fresh and perfumed, the 2004 is sublime. The 2006 Dom Pérignon is a Champagne that is going to have its day, one day. But it won’t be this evening. Readers will have to be patient with the 2006, as it is going to require a number of years in the cellar to be at its best. Even so, I expect the 2006 will always remain a powerful, phenolic wine. Tonight, the 2006 struggles to emerges next to the 2002, 2004 and 2008, but on its own it is a very fine Champagne. A bottle of the 2008 Dom Pérignon, hand-carried from France, rounds out this first flight in grand style. I have been fortunate to taste the 2008 on a number of occasions. It has never been anything less than absolutely stellar. The 2008 is bright and bristling with energy, but it also has a level of textural depth that keeps it from being austere. 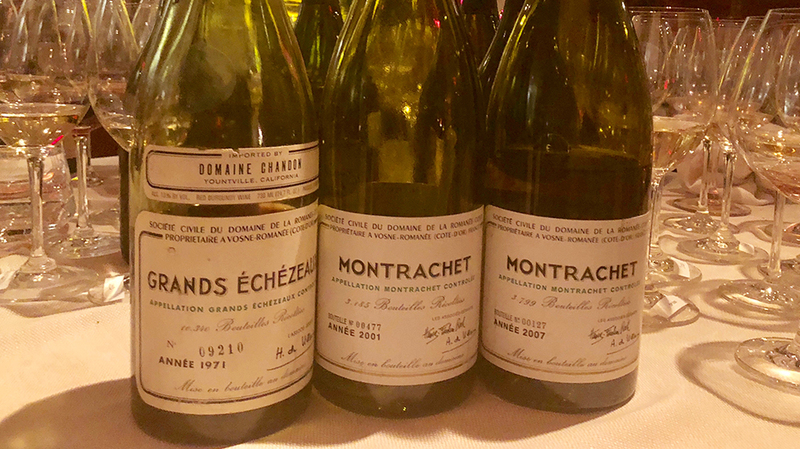 The 2001 Montrachet from Domaine de la Romanée-Conti is ridiculously great. Exotic and lush, with more tropical overtones than I have seen in other recent bottles, the 2001 is utterly captivating. Not more than a few minutes pass before the bottle is finished. Apricot, orange peel, mint and jasmine are all amped up in this vivid, voluptuous wine. I have never seen the 2001 act in such an extroverted manner. Who am I to argue, though? What a wine. Sadly, our bottle of the 2007 Montrachet is off. I have had far better experiences with the 2007, most recently just a few months ago. 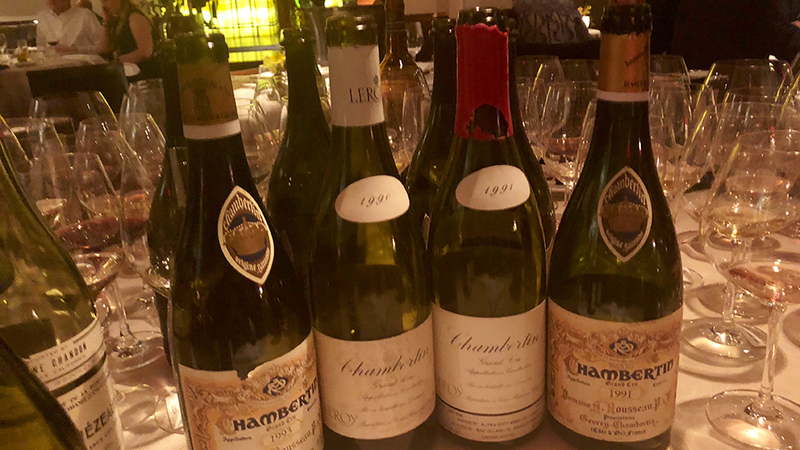 Two bottles of Chambertin from Domaine Leroy are fascinating to compare, especially as I have these wines very much etched on my mind after an unforgettable tasting at the property last month. The 1991 Chambertin is fabulous from the very first taste. Deep, layered and exquisitely perfumed, the 1991 is a classic Lalou Bize-Leroy wine from this era. Time brings out a distinctly floral quality to the dark red fruit tones. Still quite primary, the 1991 will drink well for another two decades. Today its explosive energy, freshness and vitality are utterly captivating. The 1990 Chambertin tasted alongside it needs a good few hours to be approachable. When it is first served, the 1990 is awkward, unexpressive and unyielding to the point it basically goes untouched in the glass. Thankfully I have the good sense to check in on it at the end of the evening. With several hours of air the 1990 is rich, deep and exotic. Its transformation over time is truly remarkable. Next to the 1991, the 1990 is darker and more somber in its expression, with less brightness but more overt power. I have had the 1990 twice before and not been especially impressed. Maybe it just needed time. As in a lot of time. This is its best showing yet. Rousseau’s 1991 Chambertin is usually epic. This bottle shows heavy elements of reduction and strong oak signatures that I don’t associate at all with the 1991. Although it did not occur to me at the time, in retrospect I think there is a chance this may not have been an authentic bottle. The 1993 Chambertin, on the other hand, is positively stellar. Silky, polished and wonderfully nuanced in the glass, the 1993 is all class, with generous sweet red cherry, kirsch and floral nuances. Most of the time, the 1993 Rousseau Chambertin shows more tannin and overall structure. On this night, a more refined side of its personality comes through. The 1971 Grands Echézaux from Domaine de la Romanée-Conti is a beautiful, fully mature red Burgundy. Sweet dried cherry, tobacco, rose petal and herb notes all very nicely lifted. Feminine and gracious, the 1971 has the striking inner perfume and sweetness of a wine that has aged gracefully in bottle. Bruno Giacosa’s 1978 Barolo Arione is sublime from the moment it is first opened. Sweet rose petal, tar, licorice and mint are all finely knit in a Barolo that captures seemingly disparate qualities that make the best Nebbiolo so compelling. At once translucent and yet muscular, with plenty of Serralunga structure, the Arione has so much to offer. What a gorgeous wine it is. So often today bottles like these are only tasted among large groups of people. It is a real treat to be able to drink (rather than just taste) the wines over the course of a long leisurely meal, and to be able to follow their evolution. 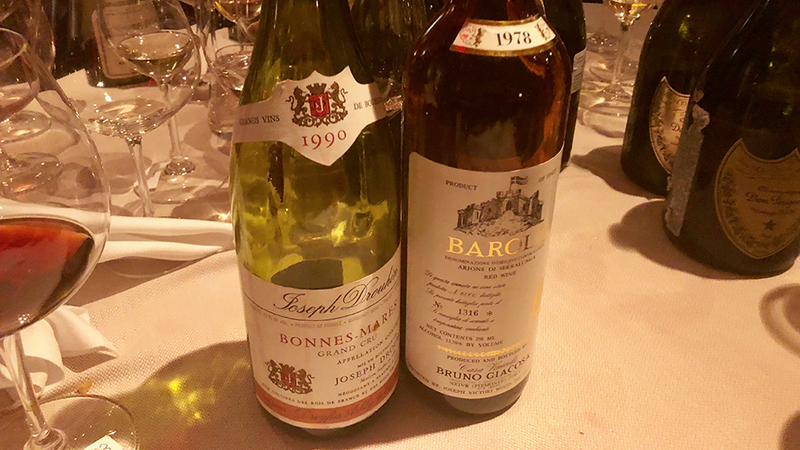 Some bottles, like the 1978 Barolo Arione, are phenomenal from the moment they are first served. But others, such as the 1990 Chambertin from Leroy, really only show what they’ve got over a good deal of time. Above all else, though, I am once again struck by the great conviviality that the world’s greatest wines inspire.